Injuries are nothing new in sports. Since these are inevitable, every athlete must be educated on dealing and caring for their injured body part to prevent aggravating the condition. For those individuals with an active job, such as a Federal Border Patrol agent, knee injuries may also occur on the job frequently. In addition, auto accidents may result in knee problems. 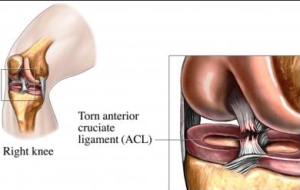 When a sudden anterior cruciate ligament injury occurs, a common trauma to the knee, individuals should understand the basics of initial treatment. Regardless of whether or not surgery is eventually necessary, the following treatment will help with pain relief. Upon sustaining a suspected ACL injury, the goal is to reduce the pain and swelling in the knee. Follow the R.I.C.E regime. R is for rest. Assist the injured person (which may be yourself), and have him or her seated or lie down in an adequately spaced area. As expected, there will be difficulty in walking because of the pain in putting the weight on the injured knee. I is for ice. 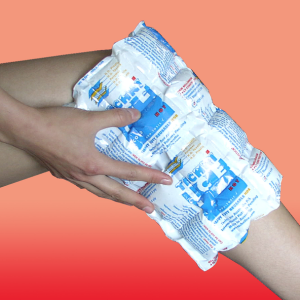 Placing ice on the injured part may bring relief from the burning sensation due to inflammation. It must be noted that the ice should be placed inside a cloth or towel and should not be applied directly to the skin to avoid freeze -burn, which can happen if the body part is exposed to cold temperatures long enough to cause tissue damage. Compression is for C. Once swelling is observed, it must be compressed with an elastic bandage. Neoprene sleeves can also be used and they are available at sporting goods or health stores. These are good materials for wrapping the injured knee. However, they really do not function much for support but rather for alleviation pain from the inflammation, prevention and reduction of joint effusion leading to swelling. Avoid wrapping the knee too tightly so as not to distribute the swelling or fluid below the bandage. Numbness, tingling and pain are signs a bandage is tied too tight. Lastly, E is for elevation.The knee should be elevated while application with ice whether you are lying down or sitting. Make sure that it is is near or above the level of the heart to reduce further swelling. The old adage “The closer it is to God the quicker it is to heal,” is good to remember when it comes to elevation. Pain medications can be taken to ease the inflammation and aching of the knee as needed. Once the swelling subsides and pain is tolerable, consult with a doctor for the diagnosis. Ask the federal workers comp doctor if exercises will be necessary regardless of the need of a surgery. This will help regain muscle strength and improve the range of motion of the knee as a preparatory measure for rehabilitation program or surgery. The patient should be guided while doing the exercises and only start with gradual movements, not pushing yourself beyond what he or she can do as it may bring additional harm than benefits. Arizona IMA has an Arizona Workers Compensation pain doctor who also treats federal injured workers and patients with personal injury claims. The OWCP claims with federal injured employees can be difficult to deal with, and most doctors won’t touch them. Arizona IMA, on the other hand, gladly handles them and is very good at it.